_© Jeremy D'Entremont. Do not reproduce any part of this website without permission of the author. _Norwalk, settled in 1649, was a major oystering and manufacturing center as far back as the 1700s. Pottery was one of the major exports. _In 1827, a lighthouse was built on 53-acre Sheffield Island to mark the dangerous ledges at the entrance to the city's harbor. The original one-story stone keeper's cottage still stands, but the site of the first tower is now underwater. The first keeper was Gershom Smith, who had bought the island from his wife's father, Capt. Robert Sheffield. In 1818 Smith had opened a hotel, or "house of entertainment," on Sheffield Island. Smith also raised cattle; the cows sometimes wandered to other islands at low tide. The Smith family lived on Sheffield Island for five generations. _The first lighthouse had an unusual and intricate lighting system. Ten lamps with parabolic reflectors were turned using a clockwork mechanism, producing alternating red and white flashes. 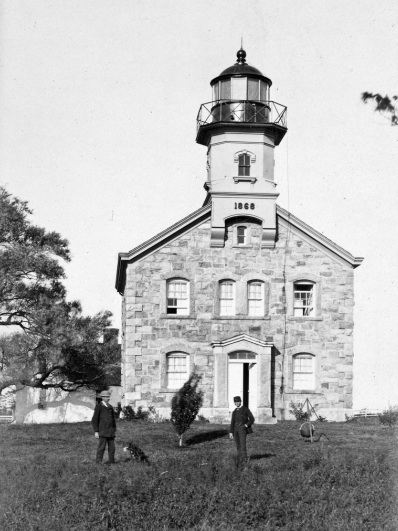 The system was replaced by a fourth-order Fresnel lens in 1857. Lantern apparatus was clean, and so was everything in and about the light-house; lamps are in good burning order, but the reflectors are poor... Keeper is alone, entirely so, and everything he has in the house is out of fix; nothing is done right; nothing is as it should be. Poor man, and miserable, and will continue so without a wife. _The stone mid-Victorian style lighthouse that still stands was built in 1868. _The style is very similar to several other lighthouses built about the same time: Block Island North Light in Rhode Island, Great Captain Island Light and Morgan Point Light in Connecticut, and Plum Island Light and Field Point Light in New York. A newspaper story in July 1872 announced that Noah Mosher, who had been keeper since 1861, had died suddenly a few days earlier. According to the story, Mosher "was seated in a chair, spyglass in hand, watching several vessels which were passing the island, and talking about them to persons standing near, when he suddenly fell backward and in an instant was dead." In August 1901, Keeper Samuel Armour became ill with typhoid fever after drinking contaminated water from the station's cistern. Armour's wife served as keeper until he recovered three months later. Sheffield Island Light was replaced in 1902 by the new Greens Ledge Light farther west. 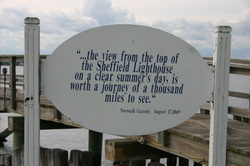 The lighthouse was sold at auction for under $5,000 in 1914 to Thorsten O. Stabell, captain of the Norwalk Yacht Club. In the 1930s, an attempt was made to create a resort on Sheffield Island, with a golf course and tennis courts. The enterprise shut down in 1937 because of the lack of fresh water on the island. _In 1991, archaeologist Karen Orawsky was working on historic site preservation on Sheffield Island. One day, as she approached the island in a boat, she heard "hypnotic and mystical" music coming from the island, with no apparent source. She also heard what seemed to be a foghorn where there was no foghorn, and distant cries for help. Some believe the music could be attributed to the spirit of Captain Robert Sheffield, who played an unusual instrument called the "long spell," like an oversized violin played with porcupine quills. The lighthouse remained the property of the Stabell family until it was sold to the Norwalk Seaport Association for $700,000 in 1986. The ten-room building was placed on the National Register of Historic Places in 1989. In 1993, major services were contributed by the Telephone Pioneers of America, Pitney Bowes employees and CVIA volunteers. A utility generator was rebuilt and electricity was added to the keeper's house. In the fall of 1993 a tropical storm named Beth sent waves crashing against the lighthouse's foundation. Stones smashed through basement windows and the basement was flooded with over four feet of water. A number of artifacts and furnishings were lost. A utility shed holding the restored generator was knocked off its footings and the generator was thrown into the water. The station's water cistern filled with seawater and had to be drained. The storm also significantly changed the shape of Sheffield Island. _Work was done in 1997 to slow the erosion near the lighthouse. Gabions were installed and beach grass and roses were planted. _The Norwalk Seaport Association raises funds through memberships and by holding a yearly Oyster Festival featuring top-name perfomers like Little Richard and Peter Frampton. Faced with the expenses of maintaining the lighthouse and initiating erosion control measures, the Association was facing a $400,000 deficit in late 1996. In 1998, Norwalk Mayor Frank Esposito and four former mayors gathered on the steps of the Norwalk Concert Hall to draw attention to the preservation of the lighthouse. "If it went into private hands it would be lost as a resource for people to enjoy," said former Mayor Donald J. Irwin. On September 11, 2000, the Norwalk Seaport Association's four-year campaign to retire the $540,000 mortage on the lighthouse culminated in a mortage burning ceremony. More recently, the association was awarded a state grant of $250,000 for restoration, and a $9500 grant from the Connecticut Trust for Historic Preservation to pay for the planning of restoration work. _A solar-powered light was put in service in the lighthouse on October 17, 2011, thanks to the support of NRG Energy, Inc. The light is not considered an aid to navigation. Right: A view from the top. The original 1826 lighthouse was in the area where rocks can be seen in the water, to the left of the point extending in the background.